Are you new to our mountain community? Welcome, from all of us at UMC Evergreen! We are excited that you've chosen to visit our website as you get to know Evergreen. As you look through our pages, we hope that you'll choose to come visit us on a Sunday morning for service, or just stop by during the week to find out more. But we'd also like to give you some information about our wonderful town of Evergreen. First of all, you've chosen a wonderful place to live! Evergreen is a small mountain community, conveniently located within an hour of most metro Denver locations. 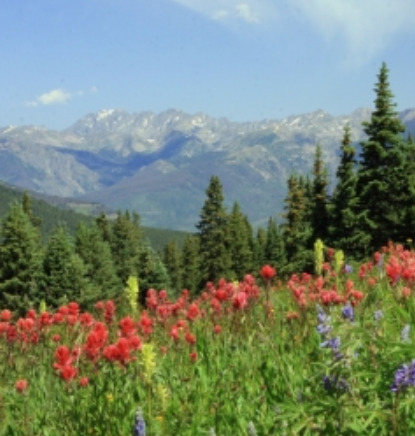 We enjoy the quiet serenity of the Rocky Mountains, while benefitting from a nearby major metropolitan area. Even if you're new to the area, you've probably already noticed the abundance of wildlife, which is one of the great pleasures of living in the Rockies! Mule deer, elk, foxes and a variety of birds are a sight so common in Evergreen that long-time residents have become used to them. Golden eagles and hawks are less common, but you will see them from time to time as well. Black bears and mountain lions do live in the area, but are nocturnal and reclusive and therefore are seldom seen. If you like being outside, you will love Evergreen! There is something going on outdoors 365 days a year here! In the winter, Evergreen Lake is a center of activity with ice-fishing and ice-skating, including the annual New Year's Eve Skate-the-Lake. We are a short drive away from wonderful alpine and cross country ski resorts. And of course there is an abundance of snow-shoeing and winter hiking trails available! In the summer, there's plenty to do as well. Evergreen Lake is a great walking, running and fishing location, but there are many other lakes and streams throughout the Evergreen area. Hiking trails are in abundance, too! And the town's two rec centers provide ample opportunity to exercise and take classes. The area boasts a number of restaurants. We also have live theater available at Evergreen Center Stage. We're an easy distance from world famous ski resorts, to the west, and the world class metropolitan appeal of Denver to the east. We are truly fortunate to live in such an amazing place, and we hope you come to love it as much as we do! For families, Evergreen has much to offer. Children's sports teams are abundant: from ice hockey to softball to soccer to martial arts. We also have some of the best public schools in the state, along with very fine private institutions as well.